You love to walk. There is nothing better than having the first tee time of the day and strolling the dewy fairways as the morning comes alive. 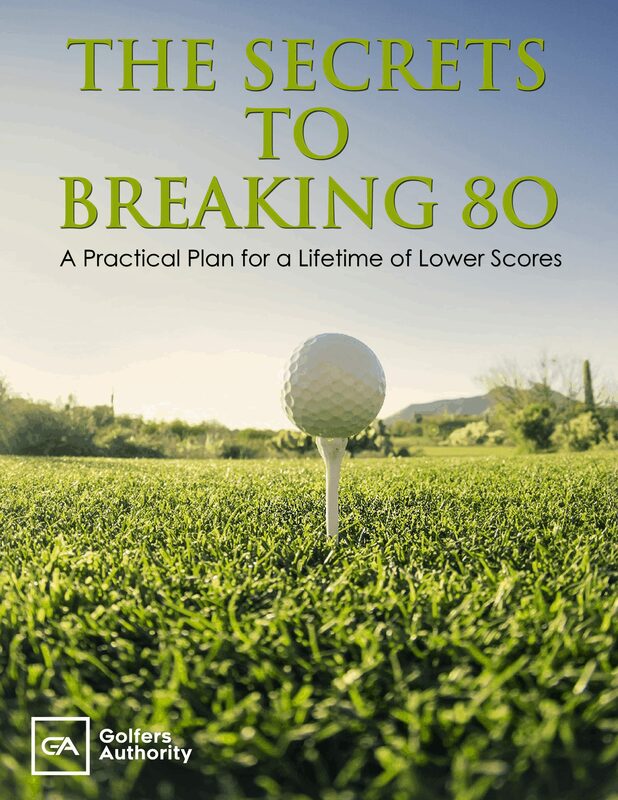 You scoff at the thought of riding in a power cart and lugging your clubs on your back just isn’t going to happen. Thankfully, modern-day golf carts fill the void. While the pull carts your dad and grandfather grew up with were nothing more than two wheels and a piece of metal, design and technology have come a long way. The golf carts of today not only get your clubs around the course, they make your entire experience more efficient and fun. Why Use A Golf Cart? 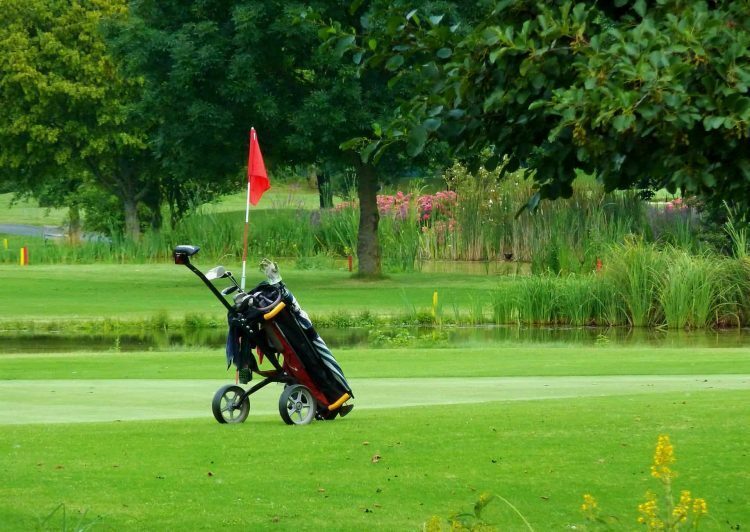 Golf carts are a great alternative for players who prefer to walk but don’t like carrying their clubs. Easily stored in the back of your car or in your garage, golf carts are used by golfers from the time they leave their car until they return at the completion of their round. 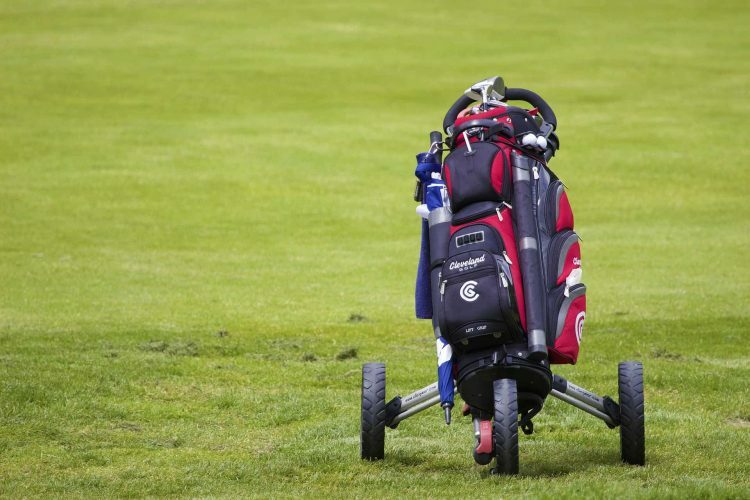 Prices on golf push carts vary depending on brand, model, accessories, and extras. Some things to consider when budgeting for a push cart are how often you plan to use it, the materials it’s made of, how much storage it has, and what kind of warranty it comes with. Costs can range from less than $100 to over $1,000. Golf carts come with numerous features that make them an asset for any player who walks. Most come with an umbrella holder that is like having a caddy there to keep you dry, or out of the sun on warm days. Other amenities include storage compartments, drink holders, and hand brakes. Push carts take on many characteristics of a baby stroller. Designed with either three or four wheels, push carts cradle your bag in front of you as you walk. The added amenities of push golf are countless but generally include umbrella and drink holders. An enclosed plastic storage compartment near the handle and a mesh pocket to store things like snacks, extra balls, or rangefinders are also typical. Most push carts are easy to set up and take down and occupy little space while stored. Because of the added features compared to a pull cart, push carts are generally more expensive. The most basic style of golf carts is the pull cart. 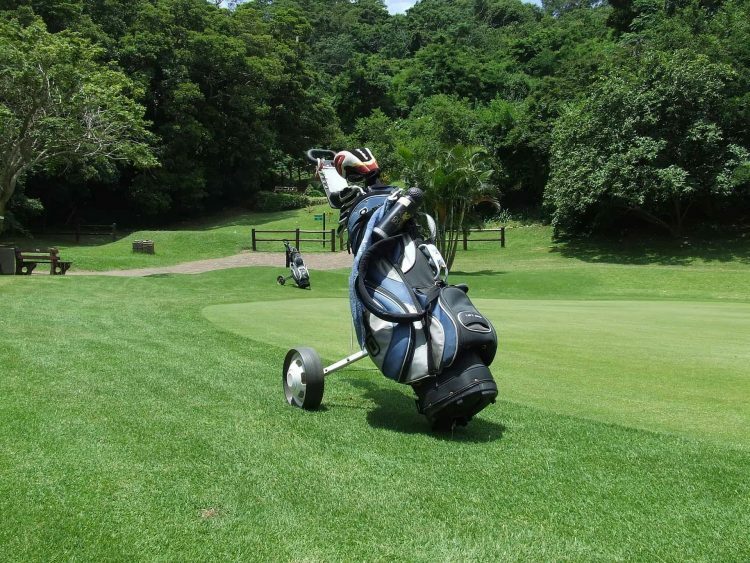 Pull carts usually have two wheels and a handle that allows to pull your clubs behind you. 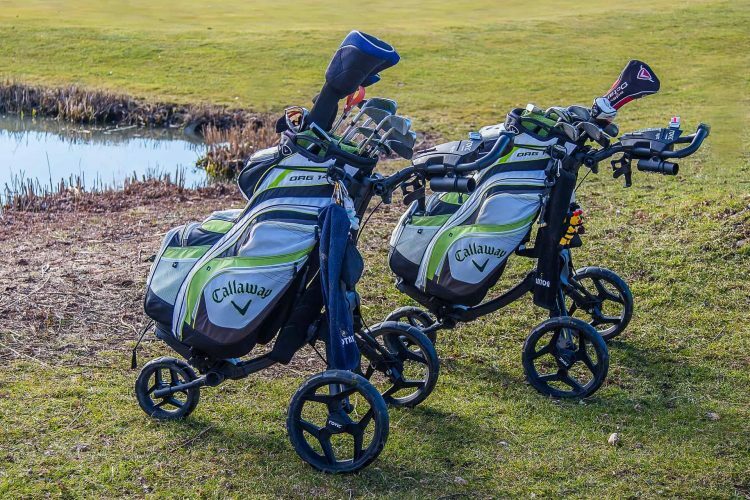 With no extra features, and serving the sole function of pulling your clubs around the course, pull carts are the most affordable option. The most expensive type of golf cart is the electric version. 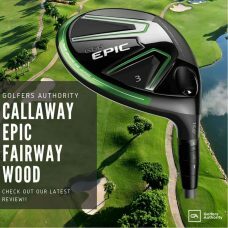 Most are battery operated and allow you to steer your bag around the course with a hand-held remote control. Playing a round with an electric cart is like having a full-time caddy because almost no effort is needed on your part beside walking from one shot to another. Electric carts can be purchased for as little as $300, but most cost over $1,000. Golf cart materials are either metal, aluminum, or titanium. 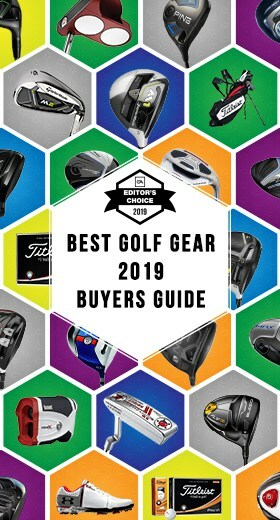 Each has its own advantages ,but knowing what type of material your golf cart is made of before you buy it is critical. Aluminum golf carts are by far the lightest golf carts available. 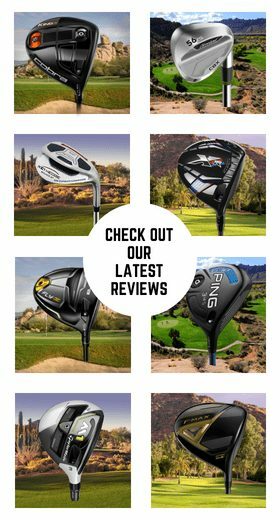 The light weight feature is perfect for players who prefer not having to work too hard to get their clubs around the course. Aluminum is a fragile material that dents and scratches easily, though. If you buy an aluminum golf cart, then you’ll need to be extra careful to make sure it doesn’t run into anything. 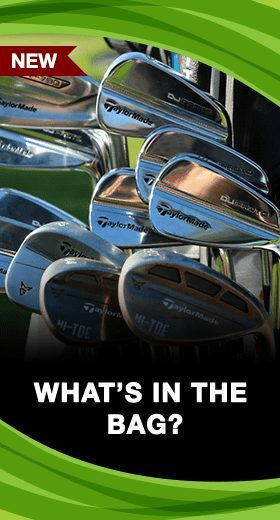 Even though titanium has been used in the manufacturing of drivers and fairway woods for years, it has only recently been used in golf carts. This material is great because it is both light-weight and durable. Since it is new and costs more to produce, golf carts made of titanium can be more expensive than aluminum or steel. The most commonly used material in golf carts is steel. Though it is heavier, its durability is second to none. If you’re looking to buy a golf cart made of steel, make sure that it’s well-mounted on a set of sturdy wheels. A well-mounted metal frame distributes the weight and makes the cart seem lighter while in use. There are many things to consider when buying a golf cart. The list below should give you some good ideas of what to consider. The functionality of your golf cart relative to your needs is important, but how much storage room it takes up matters too. Before you buy a golf cart, make sure that when it’s fully collapsed it can easily fit in your car, locker, or wherever you plan to store it at home. Though most modern carts fold up to the size of a package, checking the size is still a good idea. If you’re thinking of buying an electric cart, it’s only going to last as long as the battery. The worst thing that can happen is for your cart to die in the middle of your round. One of the first questions to ask when making a decision is how long the battery lasts and how long it takes to recharge. Some batteries can recharge in just a couple of hours, but others take 10 hours or longer. If you frequently play rounds on consecutive days, then it might be worth investing in a second battery. If your cart gives you a headache every time you open or collapse it, then you’ll become quickly frustrated. There are many ways that golf carts open and close, and some take less time and effort than others. Some carts allow you to take the wheels off, while others have numerous latching mechanisms that allow you to fold the cart up in one fell swoop. Whatever cart you choose, make sure to inspect the latching mechanisms to be sure they’re well-built and can stand the test of time. Wheel size is important for a couple of reasons. First, the wheels should be large and wide enough that they can handle the type of terrain you play on. If you frequently walk a hilly course with uneven lies, then larger tires are best because they help prevent the cart from wandering offline and tipping over. It’s also important to put your bag on the cart and wheel it around before you buy it. If the bottom of your bag doesn’t have enough clearance, it will rub against the wheels, rendering the cart next to useless. When you’re testing a golf cart, make sure the handle adjusts to a height that is comfortable. You should be able to walk comfortably and push your cart without having to bend over or stand taller. Most modern carts are equipped with hand brakes. Be sure to test the stability and strength of the brake to ensure it won’t come loose and allow your cart to roll. There are many characteristics you should consider when buying a golf cart. Budget, style, materials, accessories, and ease of use should all go into your decision. Below are some of the most frequently asked questions regarding golf carts. Q: How much does a golf cart weigh? A: Modern golf carts are designed to be lightweight and fully functional. 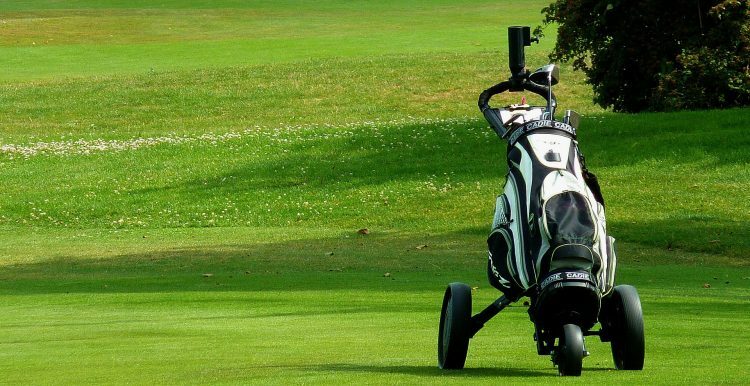 Even though using a golf cart is easier than packing your clubs on your back, you still have to get it in and out of your car and push it around the course. Electric carts also come with batteries and battery packs which can add substantial weight to the cart. Before you make a decision, be sure your cart meets all of your needs and won’t cause you any undue stress because of its weight. Q: How do you control the speed? A: A: Controlling the speed with a push or pull cart is simple. The cart simply moves as fast as you push or pull it. There are a couple of ways that speed can be controlled on electric carts depending on the make and model. Some electric carts come with a pre-set speed and a simple on-off function. The most expensive electric carts, however, allow you to control the speed with a handheld remote. This setup also includes a braking function that allows you to slow the cart down while going downhill. Q: How easy is it to assemble a golf cart? A: A: This depends on the cart. Most carts arrive with the major pieces already assembled. It’s doubtful you’ll have to screw on the wheels or attach the handle. Some basic work might be required if you plan to attach accessories like umbrella holders or other aftermarket products. Make sure that you understand how to open and collapse your golf cart before buying it. Doing so will save you time and frustration. 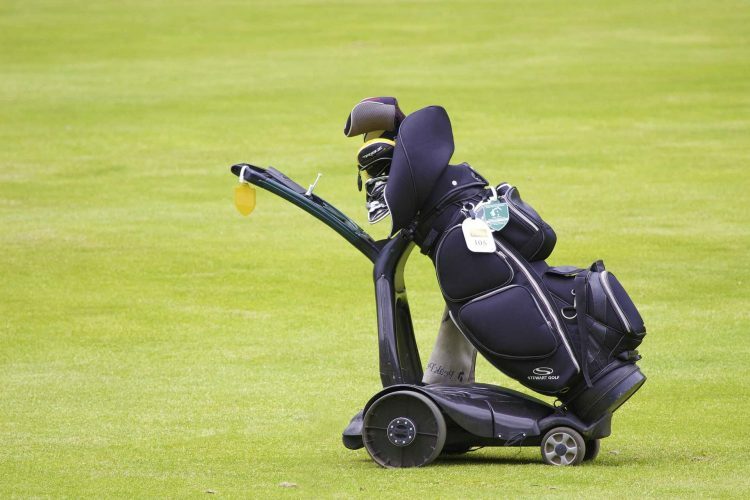 Golf carts have long been the solution for players who like to walk but don’t want to carry their bag. Modern golf cart designs not only get your clubs around the course efficiently, but make the experience more enjoyable with extra features, storage, and simple setup and takedown. If you think a golf cart is the right option for you, make sure to do the necessary research ahead of time to ensure you end up with one that meets all of your needs.